APPLICATION: These blushes are very easy to apply on the cheeks. There are no difficulties picking them up with the fingers or a make-up brush. They glide on the cheeks with ease and they're so nice to work with because the formulation made them easier to blend. Blushes are definitely so much easier to blend and to work with even for people with dry skin because the blush absorbs into the skin to prevent flakes from dry patches. PACKAGING: Blushes comes in transparent white packaging which makes it easy to pick up the desired shade when required. Its quite sturdy so there's no problem about it falling apart. I want my blush to contain a mirror, which is missing, so it's a con ! PIGMENTATION: The pigmentation is plus point of these blushes. I love the fact that you can pack on the colour for a more intensified look or you can keep it sheer to move towards a natural look. I'm not too fond of blushes that are too pigmented because it's so hard to work with them. I'd rather have a blush that has normal pigmentation than overly pigmented because it can be very overpowering and hard to work with most of the time. I'm very happy that these blushes can be applied either very intense or subtle. TEXTURE: The formulation of blushes is really smooth and creamy, but it's not powdery or flaky at all. Some blushes tend to be powdery and can create many fall-outs from the cheeks but this blush is definitely the opposite of that. Even people with dry skin can use it with ease because the formulation of the powder is not overwhelming so it's going to grab on the cheeks and add radiance. Blushes are matte powder with a luminous effect, therefore it gives the cheeks a beautiful glow that I really love! TIP: For the most natural look, always concentrate the color on the apples of your cheeks and blend well. Apply the blush along your cheekbones for instant contours. I am wearing different shades for the evening and day looks to highlight my cheek bones just the right way. Blush is ultra-light and ultra blendable, just one sweep on the brush and your cheeks smile with happiness. As you can see in the pictures, the blush blends so well with the base to give super natural look. I wore it for good 6 hrs without retouching it. It's so light and is super staying without creasing or caking at all !! It's worth a try and it will last you a very long time since it's a decent size. I Like peachy sweetie shade a lot :) Great shades!! UU amazing!! I love it! 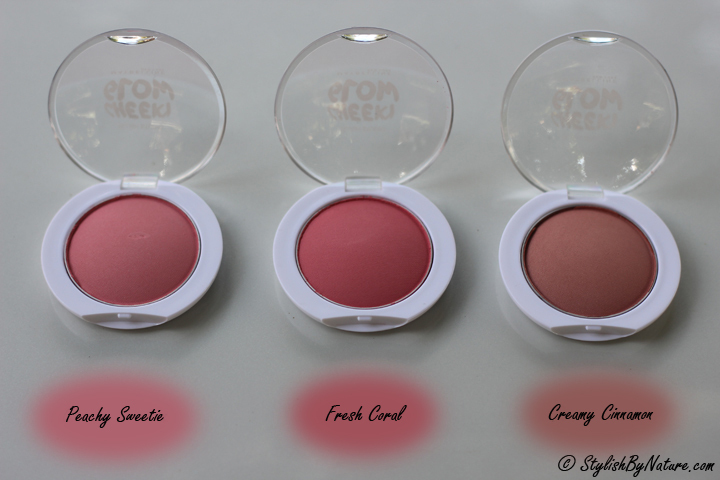 Love the sound of these cute blushes, they look wonderful on you! Wishing you a great start to the week doll! I love all these colors, The last pictures looks super Awesome. I think you should do a makeup Video. You are very good with makeups. Hey there, loved your blog, just followed you on GFC, (4488) would you mind to follow back? I love the last two shades. Amazing shades, great effect on the skin!!!! They look so beautiful on you!! I like the pigmentation of the fresh coral color. And you look pretty amazing in that last photo! Love make up at night! good tips, thanks for shared! Loved the peach sweetis blush. Just the perfect pink blush any girl would want! Αll of them look really great!